--First, ink the entire stamp surface with Summer Sun Classic Ink. Use a Stampin' Sponge to add Ruby Red Classic Ink to the "middle" and Chocolate Chip Classic Ink in the very center. The sponges allow the ink to be more gradual and less precise, much like the coloring of the sunflower's petals. Give the entire stamp surface a few good huffs (heavy-breathing on the stamp) and stamp on a piece of Very Vanilla card stock. --To add the effect of sunflower seeds, I placed a layer of Sticky Strip on the center of the sunflower and pressed it into the container of Microbeads. --I used the Distressing Tool from the Cutter Kit to rough up the edges of the Very Vanilla card stock. Adhere it to a piece of Basic Black card stock (which has been cut just wide enough to allow for the Natural Hemp Twine). --Wrap enough Natural Hemp Twine to go around the Basic Black piece three times and knot. Adhere this to the half sheet of Elegant Eggplant card stock, which has been folded in half. --The sentiment is made with the "for you" stamp from the Fresh Cuts set. Ink it first in Ruby Red Classic Ink and then in the Chocolate Chip Classic Ink to mirror the colors of the sunflower. Stamp on Very Vanilla card stock. Use the 1-inch Circle Punch to punch it out. 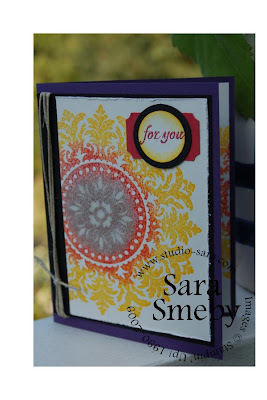 --Use the Stampin' Sponge and Summer Sun Classic Ink to add a bit of color around the circle. Punch a circle of Basic Black card stock using the 1 ¼-inch Circle Punch. Punch a piece of Ruby Red card stock using the Designer Label Punch and assemble the three pieces. --To add interest to the inside of the card, I used the remaining bit of card stock with the stamped sunflower as the writing surface. 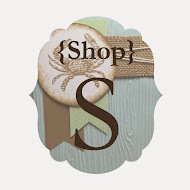 Accessories: Sticky Strip, Microbeads, Designer Label, 1-inch and 1 1/4-inch Punches, Stampin' Sponges, Natural Hemp Twine and Distressing Tool. What a fun challenge! Thanks so much for your visit! Hope you're having a lovely summer! Oh Sara! This is beautiful... what a lovely card. Love the multicoloured flourish circle for the sunflower. Bravo!! 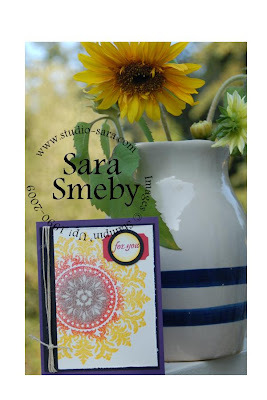 Sara...what a clever and absolutely STUNNING sunflower!!!! FABBIE job!!! WOW that flower is great! I would never have thought of it with that stamp. I have been planning to get that stamp. Now it has moved up the scale on my long lost of stamp set from SU! beautiful card and the colors you chose go perfectly together. Absolutely gorgeous! Very stunning! What a great job using the Medallion stamp to make a Sunflower! Very creative!